Web Design Leamington Spa : Public Marketing Communications : What are the differences between B2C and B2B social media marketing? A social media marketing strategy is important for any business. But this doesn't mean every strategy should be the same. The content you use will differ depending on who your customers are. Posts by a B2B business will probably look very different from posts by a B2C company. B2B companies can be sceptical of the benefits of social media. This is possibly due to a perceived inability to measure its effectiveness. (Read our blog post about measuring your marketing ROI). So what are the differences between social media marketing for B2B and B2C businesses? It all comes down to who you’re talking to, i.e. who your target audience is. ‘Content’ includes written words such as blog posts, white papers, etc. It also includes visual, audio, and interactive content. The messaging within a social media post itself is also considered content. When writing any content, it’s best to not be overtly promotional. Rather, content should provide value to the reader. Start with the assumption that no-one really cares about your company! By providing value with your content, you’ll be seen as a thought-leader and an expert in your field. Your company will then be at the top of your customers’ minds when the time comes to make a purchasing decision. 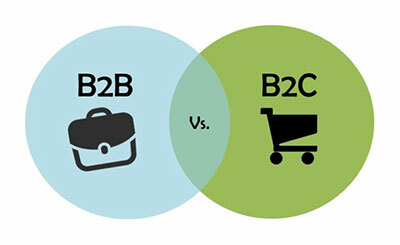 B2C companies usually focus on blog content, and link to this on social media. It’s important to think about how ‘shareable’ a blog post will be – will readers be interested or find it useful? Also, make sure there are share buttons on your website blog, so that readers can easily share your content across social channels with a single click. B2C businesses should use as much visual content as possible. Creating entertaining or informative videos, hosting them on YouTube (or similar) and then sharing, is an excellent way to do this. Social content for B2C marketers should be quite casual. An informal tone and using humour can work really well. White papers, while labour intensive, can be very beneficial for a B2B marketer. They are basically a lead generation tool. Given how in-depth a white paper can be, and how much information it provides to the reader, people are more willing to submit their personal details to access it. Lead generation is the most important goal for B2B marketers, so it’s worth taking the time to produce a high-quality piece. The case study is another brilliant lead generation tool. Case studies also prove to your target market that you can actually deliver the services you’re offering, and deliver them successfully. Creating a webinar serves two purposes: encouraging people to sign up (therefore capturing their data), and supplying you with lots of content to use repeatedly. Webinars can be edited to create different pieces of content, and used for multiple blog posts, podcasts, and even case studies. Infographics are generally thought of as a B2C tactic. This is not the case; infographics can be beneficial to B2B companies. B2Bs tend to have a wealth of data and analytics that can be put into graphical form. Using internal data to create an impressive infographic is a powerful tool to get media coverage and social shares. With the wide variety of social channels available to marketers, it's important to identify the most effective channels for your business, whether it’s B2B or B2C. Facebook was one of the very first social channels, and remains a staple of any effective B2C social media strategy. Facebook is a fantastic tool for community and customer engagement, customer support, and promotion. Twitter is one of the only 'open' social networks. This means that any tweet you send can be seen by anyone. But it’s important to understand how to make your tweets get maximum visibility. Use relevant and popular hashtags, come up with creative campaigns, and make contact with well-known people in your field. Don't forget to engage with people – interaction is key! Visual content is an incredibly effective tool for B2C marketers. Instagram can be used to give a personal face to your business. Pictures of your product or shop/office environment are often popular, and even the odd selfie can go down well. Video content is a powerful way of capturing your audience's attention. Don’t worry if you don’t have a huge budget and can’t afford to outsource your video production. There may still be value to a less polished video – it can give your company more personality. B2B marketers tend to focus on LinkedIn, Twitter and Facebook. LinkedIn is the most important for B2B businesses. Groups, in particular, should be used as much as possible for engagement and content distribution. Make sure that when distributing your content through Groups, you are not using the ‘hard sell’. If you'd like to find out how we can help with your social media marketing, including managing accounts, writing copy and creating infographics, get in touch.